In summary, you need your basic legend, scale, north area as well as optional neatline and title. Neatline is only needed if you are not placing your map in your MS Word document, since you can generate an outline around an image. The next optional component is a title, where you may not need it if you have a built in caption. Other considerations include colour, where blue should only symbolize water. One of the new features in ArcMap and other ArcGIS applications is the ability to execute multiple tasks while something is processing in the background. This is called background processing. If enabled, you can have a process running while navigating throughout the ArcMap interface. You might recall in the 9.3 version, if you were processing something, you were not able to do anything at the same time. This wait time is typically felt when processing large complicated polygons or raster files. If you are scared of this background processing and prefer the former “pop-up-window” you can disable this background processing function. Simply go to Geoprocessing, Geoprocessing option and uncheck the background processing (indicated in the video). Certainly, there is nothing to be afraid of, when it comes to the background processing. With the new version 10 interface, many functions are dynamic in addition to a locking feature for actively edited files. In many of my videos, you will see that I will be running foreground processing since it is easier to monitor process status. 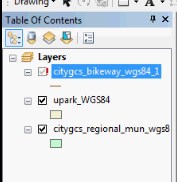 The ArcMap layer properties is my go-to window for many thing. Throughout my videos, you’ll see that I check my projection under the Source Tab or pretty up my map using the Symbology Tab. Have a look at my video: ArcMap 10 Layer properties, brief walk through. You can check your projection (very very important). Simply go to the Source Tab.